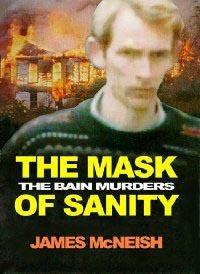 David Bain was convicted of killing his entire family and is now serving life sentences for the murders.This book is another view of the Bain case. James McNeish covered the David Bain trial for a British newspaper in 1995, and unwittingly became involved in the case. He has provided a comprehensive background into the Bain family while they resided in Papua New Guinea, by interviewing people who were friends of the family during the fifteen years they were there. He gives the reader a glimpse into Margaret Bain's diary - a woman obssessed with pagan beliefs who was to majorly influence her children and alienate her husband, Robin. McNeish provides the reader with a picture of a severely disfunctional family in crisis. According to witnesses, David, as the eldest, seemed to bear the brunt of much of the madness that surrounded his mother's obssessions. He is portrayed as unemotional and living in his own world, hiding behind his 'mask of sanity'. James McNeish gives a fresh perspective on this case and raises new questions. This book has been throughly researched and is very well written. A must read for all those who have followed the case and those who have read Karam's 'David and Goliath'. Is David Bain gulity? Let the reader decide.